I thought I would love this book, but it took me forever to get up the motivation to finish it. Especially towards the end, it struck me as very contrived, almost as if the author just wanted to finish writing and threw together an ending. The writing itself wasn't bad and flowed pretty well, but I was pretty disappointed in this book. Every time I read a new addition to this series I’m reminded all over again why I enjoy them so much. The characters are appealing, it’s historical, and Marston does an excellent job of bringing the excitement of Elizabethan theatre to a modern audience. His plot was a tad bit predictable this time, but the book carries it off fine. So hard to believe this is the end of the series. I think I like this series best of all that Marston has written. Some questions are left unanswered at the end though. At the start of Marston's spirited 16th entry in his Elizabethan Theater series (after 2005's The Malevolent Comedy), book-holder Nicholas Bracewell and the Westfield Men sail for Denmark with their twice-widowed patron, Lord Westfield, who has been enticed into marriage with Sigbrit Olsen, an alleged beauty he has seen only in a miniature painting given him by his shady business agent, Rolfe Harling. After narrow escapes from storms and pirates, Bracewell and company arrive in remote Elsinore, where Harling is murdered in the castle basement and unknown ruffians assault veteran actor Owen Elias. Bracewell's sleuthing skills again prove up to the task as he begins to suspect a ruse after Westfield's comely fiancée avoids seeing her future husband for days preceding their wedding date. A coded message found inside a chess piece adds to the suspense. This newest Elizabethan theater mystery is, I think, one of his best. Lord Westfield, the patron of Westfield’s Men, is about to marry for the third time. His chosen bride (although he has seen no more than a picture of her), is Sigbrit Langberg, and “almost” Danish princess. Lord Westfield invites his theater troupe to accompany him to Denmark and put on a play to honor his bride at the wedding. Many things go wrong on the way – they are attacked by pirates, and have to change their planned itinerary – and Nicholas Bracewell begins to suspect that things are not as they have been told to be. As usual, Bracewell comes to the rescue and saves the marriage from taking place. While I enjoyed the series characters, I thought the book was overwritten. Enough already with the perils--storm AND pirates? Villains missing again and again? Too much around the castle hi-jinks, too. Seems like a good snip or two would have been useful. And the deus ex machina at the end--I think not.Good period detail, though, and nice texture. I'm assured that others in this series are better written. Hope so. If it wasn't for the holiday season I would have read this book in about 3 to 4 days.....this is an excellent read, and sadly the last in the series......so far. "The Return Of Nicholas Bracewell & Westfield's Men", we could only hope. 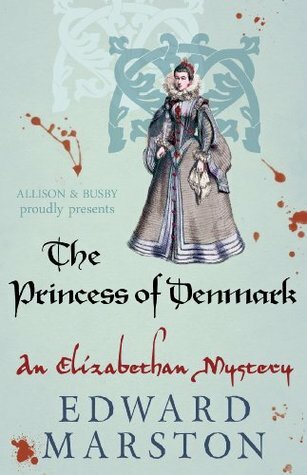 Read this mostly because it was set between Elizabethan England and Denmark. Two of my interests. Book was a mystery that spent less time on the main mystery and most time on a 'side' mystery. Written fairly well, but not sure how authentic it was to the timeperiod. A nice historical fiction set in Elizabethan England.